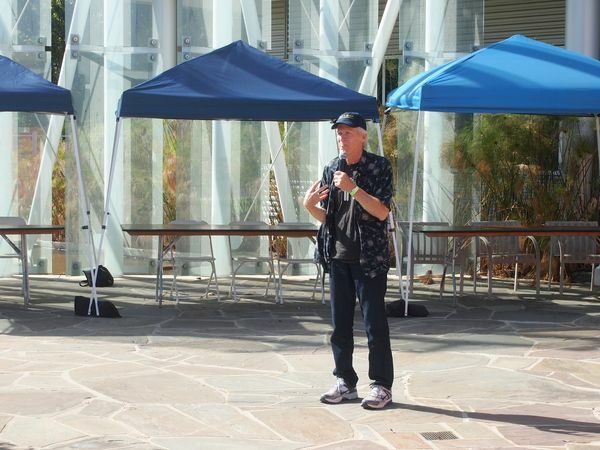 Speaking before a crowd of electric car owners gathering in Silicon Valley, long-time EV activist turned Nissan Leaf salesman Paul Scott talked about the big strides being made in electric vehicle adoption, and the coming tipping point. The San Francisco Bay Area was recently named by Nissan as the top US market for the Nissan Leaf, and on Saturday the force of that area's electric vehicle community made itself known with a large gathering, the EV Summit 2013, organized by the SF BayLeaf's and the Silicon Valley chapter of the Electric Auto Association. Hundreds of electric vehicle owners gathered in celebration and even drew participants from far outside the SF Bay Area, including Paul Scott and Zan Dubin Scott, both long-time electric vehicle activists who helped with starting Plug-in America. Speaking before the crowd, Paul Scott, now working as a Nissan Leaf dealer, talked of the massive upswing in electric car sales and a coming "inflection point." The event was held on the Google campus in Mountain View, and featured food, entertainment and plenty of electric cars in the parking lot. In addition to the dozens of electric cars driven by participants, both manufacturers and car dealers came with cars to show including: Toyota RAV4 EV, Tesla Model S, Fiat 500e, Nissan Leaf, Renault Twizy, Via Motors VTRUX, Chevy Spark EV. The AAA had a contingent of people showing their mobile charging truck for electric vehicle response. The truck carries both level 2 charging, and a 20 kilowatt CHAdeMO fast charger. Talking about the US sales success of plug-in hybrids and all electric cars, Paul Scott noted there are now over 100,000 plug-in electric vehicles driving the roads of America, including both plug-in hybrid and all electric cars. We're about 2 1/2 years past the introduction of the Nissan Leaf and Chevy Volt, and about 1 year past the introduction of the Tesla Model S. Prior to the introduction of these electrified cars, there were only a few thousand electric cars in total, including Tesla Roadsters, the remaining Gen1 Toyota RAV4 EV's, Ford Range EV's, and several thousand home-built electric conversion cars. Jumping to a population of over 100,000 plug-in electric cars is a phenomenal leap, but it is just the beginning. The coming inflection point Paul Scott spoke of will come, he says, when Tesla delivers on its promise of the affordable mass production electric car, currently expected for the 2017 model year. They have to line up some technology partners to make that car feasible, but the company is repeatedly promising that it will have a 200+ mile electric range, will cost $35,000 MSRP (before any tax breaks), and that Tesla will be building those cars in the hundreds of thousands of units per year. By comparison the Gen2 Chevy Volt should become available in about the same time, have a $30k MSRP, and an electric range around 70 miles. The Volt or the Leaf or other electric cars may have a hard time competing against a 200+ mile range Tesla sitting in the middle of their price range.